This prairie was established in 1999 in the 4.5 acre agricultural field near Pleasant Valley Road. Its location is shown on the Management Map. It is at the bottom of the ridge and receives drainage from a major ravine at its east end. Because of this, it is considerably more mesic than Toby's Prairie. However, it is not as level, rising considerably towards its north side. Also, the southeast and southwest corners rise sharply. The soil in these corners is quite sandy and favors the growth of sand prairie species such as lupine. 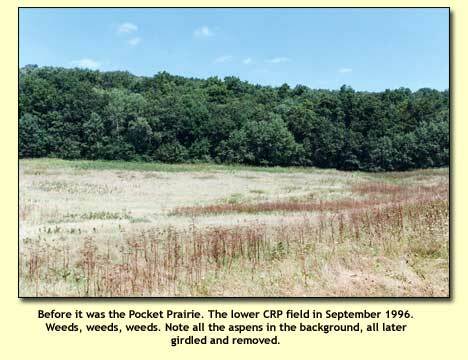 This field was treated with herbicide in 1998 when the upper CRP field (Toby's Prairie) was treated, but it was not planted until 1999. In 1999 it was treated three more times with glyphosate and burned in August 1999. Planting. It was handplanted in November 1999 with 90 species of forbs and grasses (see photo below). All the seeds were hand collected, either at Pleasant Valley Conservancy or at nearby sites. Because of the variety of habitats, different seed mixes were used in different areas. The sandy areas received more dry-site grasses such as little blue stem and side-oats grama, as well as lupine. The mesic areas, and especially the areas receiving drainage from the ravine, received plants thriving in wetter areas, such as cup plant and prairie dock. Versatile grasses such as Indian grass were planted uniformly over the whole field. 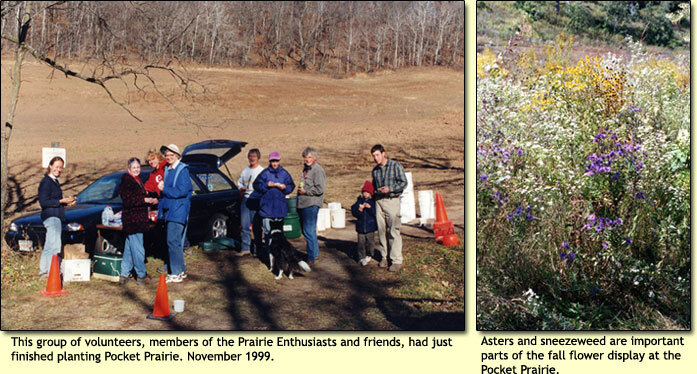 In 2000 it was mowed twice, and in 2001 prairie plants were well established so that no further mowing was done. However, there were still some annual weeds, wild parsnip, and several patches of Canada thistle. Wild parsnip was hand-pulled and the thistle controlled by mowing. A good controlled burn was carried out in March 2002 and the prairie responded well. Excellent growth of prairie grasses and forbs occurred in the summer of 2002, making this an excellent source of seeds for further planting. It has been burned annually thereafter, although in 2006 the east side was not burned. Eventually it will probably be burned on a three-year burn cycle, but plans are to continue annual burning for the near future. Annual weeds, wild parsnip, and Canada thistle are no longer a problem. However, bird's foot trefoil (Lotus corniculata) is a persistent perennial weed that remained a problem. For some years it was controlled by hand-pulling, and although this reduced the infestation, it did not eliminate it. Since 2010 it has been controlled by a special herbicide procedure. Since the stems of a bird's foot trefoil plant grow from a single tap root, the center of this tap root is given a brief "spritz" of 20% Garlon 4 in bark oil. This is all that is required to kill the plant, and damage of adjacent "good" plants does not occur. This procedure has been successful in eradicating bird's foot trefoil, although new plants still arise from the persistent seed bank. The Pocket Prairie has developed into an outstanding prairie, and because it is highly visible from Pleasant Valley Road it serves as a showcase and demonstration area. 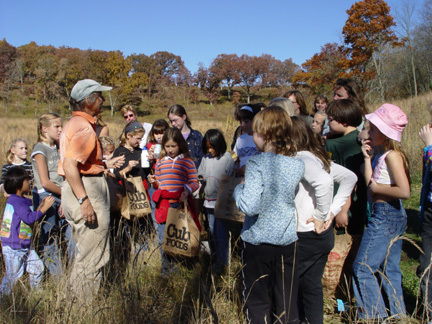 Educational field trips generally start at this location since parking is possible and the view of prairies and savannas permits a broad overview of the restoration process. 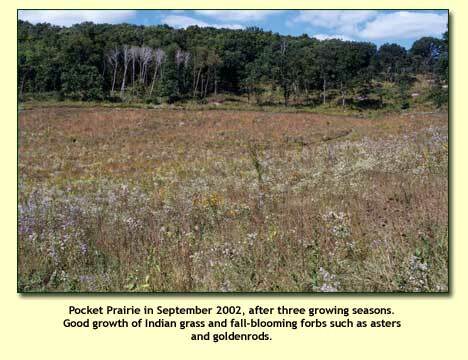 In April 2008 the Aldo Leopold Foundation used the Pocket Prairie for the practical work in one of their burn schools. This prairie has a wide range of habitats, from wet mesic to dry sandy. In 2004 all four native Wisconsin Silphiums bloomed and set seed: S. integrifolium (rosinweed), S. laciniatum (compass plant), S. terebinthinaceum (prairie dock), and S. perfoliatum (cup plant). Sandy areas in the SE and SW corners have had extensive shows of colorful lupine (Lupinus biennis). Asters and goldenrods have done well. Old-field thistle (Cirsium discolor), pale Indian plantain (Arnoglossum atriplicifolia), penstemon (Pentstemon digitalis), prairie cinquefoil (Potentilla arguta), prairie brome (Bromus kalmii), showy tick-trefoil (Desmodium canadense), pale purple coneflower (Echinacea pallida), rattlesnake master (Eryngium yuccifolium), Liatris aspera and Liatris pycnostachya, black- and brown-eyed susan (Rudbeckia hirta, R. triloba), spiderwort (Tradescantia ohiensis), and golden Alexanders (Zizia aureus) are all doing well. Indian grass (Sorghastrum nutans) is the principal prairie grass, although there are areas with big and little bluestem. See check list below.